Both losing my virginity and helping save the world from nuclear destruction seemed a good way to spend Easter weekend 1962. I hadn’t long turned 17 and each mattered as much as the other. 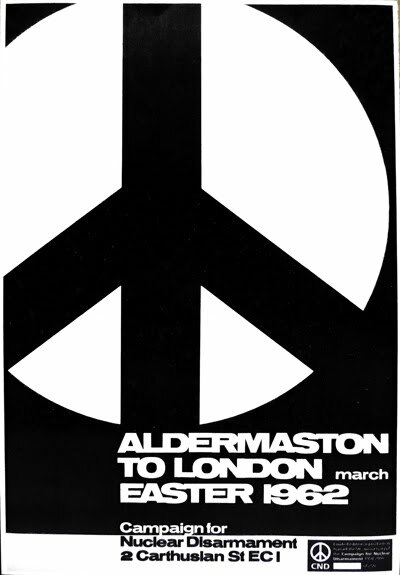 The Campaign for Nuclear Disarmament’s Aldermaston march – from the Berkshire-based Atomic Weapons Research Establishment to London – was certain to provide opportunities towards achieving the twin objectives. How hard could it be – 52 miles over three days? My school friend Harry’s father drove us to Aldermaston in what seemed only minutes. The details are a bit vague now but I think we dropped our sleeping bags off on a specified coach to be collected at our first over night stop under a marquee in Reading. Much else I recall in painful detail. We were told not to respond to any provocation from onlookers. Insults would have been a welcome diversion from the drizzle, the snail’s pace at which we advanced, and the hunger. I’d reasoned I could survive on a large bag of peanuts and raisins and a packet of Durex. I was wrong on both counts. I must admit the songs were fun. “It’s now or never/Ban the bomb for ever more.” And there were the chants. “Macmillan (the British prime minister) out; Macmillan out; Macmillan out, out, out.” Not particularly inventive but pretty effective when shouted from many throats. My own contribution “Khrushchev (the Russian premier) out…” was not welcome nor repeated. Although thousands marched, hour after hour I kept pace with the same fifty or so people in the hope of clicking with any of the girls. This was the Sixties after all. The unexpurgated Lady Chatterley’s Lover had been on sale for a couple of years. Disaster struck. In preparation for my de-flowering, I’d a long soak in the bath the night before. I learned a hard lesson – you do not soften up feet before a first long walk especially if you’re going to wear the wrong socks and ill-fitting shoes. My feet blistered badly. I fell behind and limped late into Reading. All thoughts of seduction gone, I found Harry and my sleeping bag. Sleep didn’t come. Across the other side of the marquee’s gloom someone was having a good time. A girl’s distinctive giggle – “hee, hee, snort, hee, hee, snort” suggested the delights denied me. Whoever she was is likely to be a grandmother now and I hope still having fun. The next morning my feet were in a bad way. After a mile or so I hopped literally on a bus. The upstairs was packed with ‘marchers’. On arriving in Slough, I headed for the station. It is no exaggeration to say on reaching Paddington, it was a struggle to walk down the platform much to the amusement of the railway porters (a now mostly extinct breed). I got home and my father had to half-carry me to bed. I followed the rest of the Aldermaston march on television. After the Cuban Missile Crisis in October of that year, the supporters of the doctrine of mutual assured destruction went 1-nil ahead and I ceased to be convinced of the merits of unilateral nuclear disarmament. Very difficult to walk long distances, first time, straight off, whatever the footwear, without getting blisters.